The band is currently not performing. Play the clip below to hear and see the Wongawilli Band. 3 minutes 17 seconds in duration. wongawilli from Why Documentaries on Vimeo. Click here for a 3MB MP3 clip of 8 songs and tunes from Australia Street. Waltzing Matilda (Queensland version) - Victor Podham's Rusty Hut - Sing Us a Song - Coming Down the Mountain (reel tune) - Time is a Tempest - Coopers Sparkling Ale - The Drunken Parson (jig tune ) - Waltzing Matilda (most heard version). Click here for full song samples at Wongawilli Myspace site. 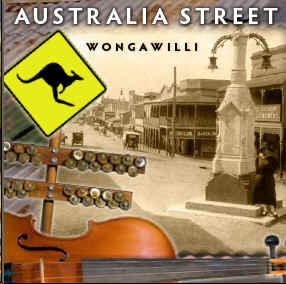 The Wongawilli Band from the South Coast of New South Wales plays traditional and contemporary Australian folk songs, dances and music of the European settlers to Australia. They play a range of instruments featuring piano, violin, accordion, guitar, lagerphone, banjo, whistle and mandolin. They also perform with the Wongawilli Colonial Dancers in presenting demonstrations of bush and colonial dances from Australia's European settlement. The band was established in 1987 and has produced 7 recordings. The latest recording is Australia Street and was released in June 2008. Click here for more information on the new CD. For where they're playing - pubs, dances, concerts, schools, folk festivals check the News Section at the bottom of the Home Page. The band was originally formed in 1987 to help promote, preserve and perform Australia's rich tradition of music, song and dance. The year 1988 proved to be a busy one with the band gaining quick popularity and performing at over 50 functions. The band combined on many occasions with the Wongawilli Colonial Dancers to present a unique presentation of Australian bush music and dancing. The current band of David, Tania, Samuel, Miffy, Graeme, Tim, Reg and Johnny has been in place since 2006. They have produced the recording Australia Street. The band has become well known throughout Australia with performances at all major folk festivals - Woodford, Port Fairy, Victor Harbour (SA) and the National Folk Festival on numerous occasions. The year 1998 saw a major change for the band. Two of its long standing members John Harpley and Neil McCann decided to move on. John moved to Yass and Neil, the band's primary songwriter, enjoyed more time with his family. The new youthful additions were Jason and Chloe Roweth from Bathurst and fiddler Jane Brownlee from Sydney. They joined father and son, Graeme and Reg Murray, and husband and wife, David and Tania De Santi (Jane's older sister). 1998 also saw the release of a compilation recording of the band's two previous productions - After The Tradition and Australian Selection. 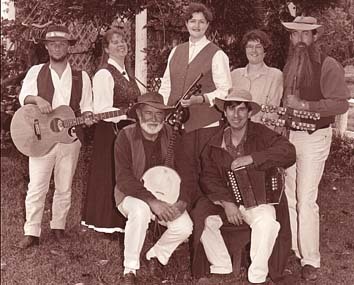 The recording was released in North America by Musica Pangaea, who were specialising in world and Australian Folk Music. The new recording was titled Australian Tradition and is 78 minutes long and received airplay in the US, Canada, Europe and the Mid-East. Other projects during the 1998 were year playing with the BHP Youth Orchestra and the SBS Radio Television Choir as part of a special presentation on migration songs, dances and music in Australia, titled the Southern Cross is Calling. The band continues to help with the organising of the Illawarra Folk Festival at Jamberoo, with David De Santi as Artistic Director since 1996. The band along with Wongawilli Colonial Dance Club also established the Australian Folk Music and Dance Gathering to provide a more focused event based on Australian folk music. The aim of the group was and still is to perform and promote and hence preserve Australia's rich heritage of music, singing and dancing. The band prides itself in the truly Australian dances it performs such as the Varsoviana, the Schottische, the Quadrilles and Galops in addition to the normal bush dances expected by bush bands. Since 1990 band members have published books on Australian folk material through the Pioneer Performer Series. The band's music can also be found as Production Music for use on radio and television through Andrenalin Sounds. The band is well known for its dance music and Australian dance repertoire, with over 80 dances in the band's repertoire. Performances have been provided for the National Folk Festival on a number of occasions, the Sydney Bush Music Club and Melbourne / Canberra and Adelaide Colonial Balls. The following is a selection the band can teach and present. In particular the band's singer, Graeme Murray, received the 1991 Australian Bush Music Awards Best Male Vocalist ahead of John Williamson and Alan Scott. He has repeated the award in 1993 and 1994 and has become the "Voice of the Bush". He shared the award in 1993 with Pat Drummond. Also the band's accordionist, David De Santi, along with Rob Willis of Forbes received the 1992 Australian Bush Music Heritage Award for their work in promoting and preserving Australian dance and music with the Pioneer Performers Series, a compilation of books and cassettes. The band has played at numerous events around the world, the Illawarra region and around Australia since 1987. Many 1988 Bicentennial Celebration functions such as the Bicentennial Exhibition, Wollongong, Shellharbour, Kiama and Shoalhaven Council Australia Day celebrations. The band toured Australia from July to September 1992 with functions at the Adelaide Colonial Ball; Alice Springs Folk Club, Bush Dance; The Overlander Steakhouse, Alice Springs; Tennant Creek Folk Festival (NT); The Four Seasons Resort, Jabiru; Darwin Folk Club, Bush Dance; Armadale Folk Club (WA); Nannup Music Club (WA); and WA Folk Federation, Bush Dance in Perth. Three members of Wongawilli - David and Tania De Santi and Jane Brownlee - were joined by Bruce Cameron from Bathurst for a tour of the western coast of North America in February 2001 and attended the North American Folk Alliance Convention in Vancouver, Canada. They performed a majority of Wongawilli repertoire and received great responses. More details on the tour and The Wombats. Please note that the Club does not manage the Wongawilli Hall anymore. Click here for information about the Hall and how to hire it.